Austromyrtus dulcis also known as Midyim Berry is a ‘bush tucker plant’ that is found Northern NSW (New South Wales) through to Fraser Island in Queensland. A low growing shrubby spreading shrub reaching up to 2 m. Sometimes used as a ground cover plant it occasionally called the ‘sand berry’. Regarded as one of the best of all of the Bush Tucker Plants it also doubles as an attractive garden plant. Fruit can be harvested in autumn and plants can be given a very light prune at this stage as well. The fruit does not travel well so is rarely seen for sale away from it natural habitat. Being a small shrubby plant this is a Bush Tucker plant that can be grown in a container. Reaching a height of around 90cm in good conditions the plant will spread over 2m, sometines more. As it can be pruned it can also make an interesting low hedge. The fruit that follows the white flowers of summer is a speckled white about the size of a small birds egg, sweet with an unusual taste. 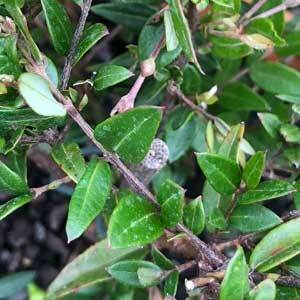 Growing well in light shade to full sun Austromyrtus dulcis requires a frost free position. It also grows well in coastal conditions. Tubestock - [50mm forestry tubes and 70mm supertubes] specializing in Bush Tucker Plants , Natives indigenous to the NSW South Coast , Permaculture Plants - Fruits, Nuts & Berries .